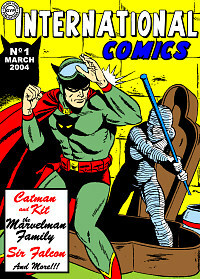 Online reprints of comics in the public domain. Featuring my line of CDs, free downloads, etc. A complete list of all known public domain comics online! A complete listing of where each character/feature has been reprinted. Misc. items pertaining to the history of the Golden Age! A running list of the Golden Age books I own, and have had donated for reprinting. Links to all sorts of things pertaining to the Golden Age and Silver Age! How I create my reprint books! I'm in the process of reposting back issues. If a link doesn't work now, please check back soon! The Official Club of the Golden Years! The Squad is now active as a Yahoo Group!!! All you need to join is a free Yahoo membership! All comics/stories posted on this site are believed to be in the public domain. They are here for historical preservation and reference. If I have made an error and the current copyright holder does not wish for the book to remain here please let me know and I'll remove it immediately. Thank you. Last issue published on September 3, 2003. Last issue published on August 3, 2001. Last issue published on May 17, 2002. Last issue published on March 26, 2004. Last issue published on January 19, 2001. Issues 3 and up will be on CD-Rom. Last issue published on September 21, 2001. Last issue published on September 1, 2003. All comic books, characters, etc. on this site are property of their respective copyright holders. The Golden Years, and all original material on this site is property of Golden Years Publications, and is not to be used without the permission of the owner. This site was designed with Microsoft Internet Explorer 6 and Netscape Navigator 4.7 with 800x600 High Color (16 bit) monitor display. If you have another browser and something doesn't look right please notify me of the problem. Thank you.